The airframe is primarily constructed of laser cut balsa and plywood with a sheeted foam turtle deck. The airframe is expertly covered in genuine ultra cote. Included in the kit is entire airframe with two piece wing, landing gear, wheels, wheel pants, pushrods, control horns, hardware package, and detailed direction booklet. The level of prefabrication from the factory is outstanding. Typically glue is one of the items need to assemble an airplane but not with the Hangar 9. All that’s needed is basic shop tools and a few evenings to get the Extra completed. The Extra goes together quickly with everything jigged up and pre-drilled from the factory. The aluminum landing gear secures to the fuselage via machine screws. No guess work with the wheels and pants just put the screws in the holes! Another example of detail is the wheel axles having ground flats for the wheel collars to lock onto. The tail wheel fastens in the same manor with machine screws with the steering springs needing to be fitted with pliers. The wings use an indexing dowel, beefy carbon fiber spar tube, and four nylon finger attachment screws to keep them securely in place. The Extra is pre-hinged with Robart style pin hinges and gap sealed at the factory with exception of the rudder. The rudder uses a flat style Klett hinges but the hinge pin is not installed. A master hinge pin slides in from the bottom and is locked into position by the tail wheel bracket. This makes the rudder removable if necessary. The engine cowl uses a plywood reinforcement structure and mounting screws are within the fuselage hidden from sight. The top deck/canopy is a work of art with canopy seamlessly faired onto fiberglass skin and smothered in glossy layer paint. Instead of using the included decals from the kit I added some custom decals from Kirby’s custom graphics. The Extra 300 is designed around a 100cc engine. That being said we all know when picking an engine, especially when looking to do a little 3D that the more powerful the better! However in many cases horse power comes with a weight penalty. Desert Aircraft makes the decision a no brainer with its super light DA120 that has the same footprint of a 100cc engine, yet more powerful, and is actually lighter than your typical 100cc. Engine installation was a snap with the fire wall being spaced and predrilled for a DA engine. For an exhaust system I went with a pair of MTW 75 canisters to keep the exhaust note to a minimum and a little extra power to boot. Prior to installing the exhaust, a large bay of covering must be removed from the belly to expose the factory installed exhaust mounts and also a cooling air outlet. The balsa wood exhaust tunnel has a clear coat applied to prevent any oil or fuel from penetrating the wood. A length of silicone tubing is weaved through a series of holes in the pipe mount and acts as a vibration dampener and prevents any chafing. The ignition module got a layer of foam prior to the Velcro strapping. 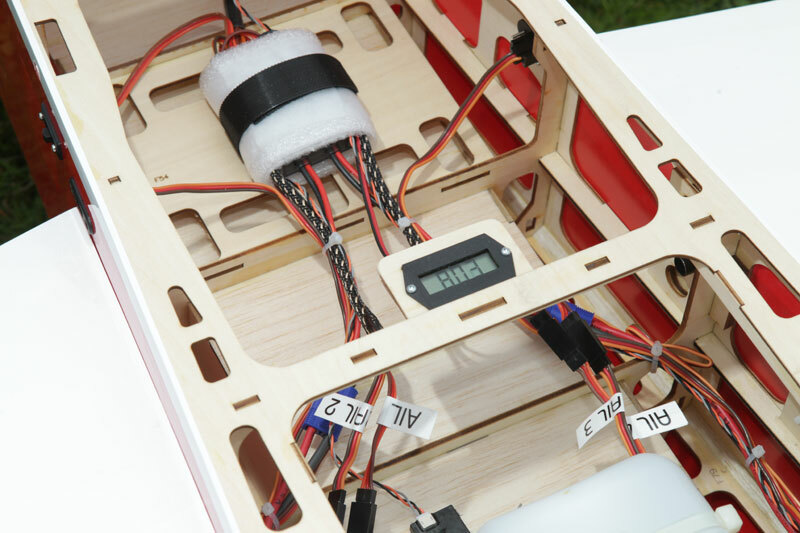 Powering the ignition module is a Spektrum 7.4 volt 2000 mAh LiPo battery through a JR 5203 voltage regulator. A Smart fly optic engine kill switch adds to the safety factor with ability to turn off the engine with the radio. Plumbing the DA was a snap with the fuel tank and lines pre-installed at the factory. I installed a DU-BRO fuel filter and Hangar 9 fuel dot for filling the tank. Finishing touches on the engine are the installation of a red anodized Tru Turn spinner and Vess 28B prop. My engine installations typically have Tru Turn’s and Vess props… when you find a good thing you stick with it! For a radio system, my JR 12X transmitter with trusted DSMX 2.4 technology does an awesome job at command control. For a receiver a Spektrum AR9110 DSMX that’s built to handle the extreme demands of today’s large scaler. JR’s new DS8911HV high voltage servos work with the voltages modern light weight lithium batteries eliminating the need for voltage regulators and simplifying radio installation. Powering the receiver is a pair of Spektrum 7.4 volt 4000 mAh LiPo battery packs. To keep a close eye on the battery voltage I installed a Smart fly volt meter. Servos simply screw into their respective pockets. I installed Airwild aluminum servo arms prior to installation. Short control rods with ball links connect servos to the factory installed control horns. The JR 537 throttle servo was wired to a JR 5203 voltage regulator to lower the voltage. The fuel tank is installed just behind the main wing tube There is plenty of room to route the wiring and keep everything neat. Notice I stalled a digital voltage meter. The DA120 provides more than enough power to get the Extra 300 through any maneuver. The DA120 provides more than enough power to get the Extra 300 through any maneuver. The bottom of the fuselage is already setup for the canister exhaust system. Everything fits perfectly. The throttle servo is installed on the bottom of the engine box. Once the cowl is on, I installed my choke lever Beautiful Vess prop and red anodized Tru Turn spinner complete the front end.